Richie Cunningham takes running to extremes. Last December he won the Fuego Y Agua 100km race in Nicaragua. He completed the race, named after an active volcano and a dormant one which must be run up and down, over 2500m of ascent, in 11 hours and 40 minutes. Richie, who lives in Fife and runs for Carnegie Harriers, regularly competes in the 95 mile West Highland Way Race, this year finishing 3rd with a PB of 16 hours 24 minutes. Along with other ultra-marathons and hill races he has entered many 24 hour races where the winner is the person who clocks up the highest mileage. This year's WHW race is on the Adventure Show, BBC2, Sunday 4th October at 7pm. What prompted you to begin running and how old were you? When I was young I used to play a lot of football, sometimes 2 or 3 matches in a day and when I wasn't playing I was training. I used to love pushing myself to exhaustion and then trying to push out a bit more! Then, as a teenager I turned to endurance partying for a few years before walking the West Highland Way a couple of times and then becoming a keen Munro bagger. Hill running was just a continuation of this and my first hill race, Stuc a' Chroin in 1998, seemed a natural progression and from that I moved into ultras. At what point did you realise you were interested in running really long races? After the Glen Clova hill race in 1998, which I found really difficult and struggled to finish, I decided I was going to "crack" these long races and entered all the "longs" I could find. When I learnt of the West Highland Way Race I decided to use three races to work towards it, The Paps of Jura, Speyside Way and The Devil O' the Highlands. What has been the most rewarding experience you have had? In my "running life" I find it really rewarding seeing other peoples successes. At this years UTMB race it was such an emotional experience watching all the finishers after almost 2 days of running continuously winning their personal battles and realising months and often years of training. Where do you keep your WHW race goblets? Do you have enough for a dinner set yet? It's terrible, all my goblets are in a box packed away I should really have them on display! I've got a bit of a mixture, 3 goblets and 2 tumblers (for 3rd places in '08 & '09) so another goblet might even it out a bit. When will you win the WHW race? You were 13 minutes behind the winner this year, presumably thats the sort of difference thats acounted for by an extra bite of pasta. . ..
What other ultra-endurance races have you competed in? Which were the most memorable? I've ran 34 ultras since 2004 so lots of different memories. This years West Highland Way Race has got to be the most memorable because I focussed on it for months before and everything came together on the day, and just being part of that amazing finish was a privelidge but also because it was the last race organised by Dario Melaragni before he passed away so, the end of an era. What is your PB for a 24 hour race? 127 miles 1119 yards on the 400m track at Tooting Bec, London last year. This is a sore point for me at the moment having just competed for Scotland at the Commonwealth Championships in Keswick at 24 hour. I had a very disappointing race for various reasons but I'm now determined to crack this event once and for all. What are your favorite foods for running? On the whole I eat a healthy diet packed full of carbs and loads of greens. I don't eat meat only the occasional bit of fish. During heavy periods of training I crave junk food, my favourite is chips and curry sauce and I've been known to eat whole packets of chocolate digestives in one go but I think this is the body telling you what it needs. Also I don't take any food supplements or vitamins and haven't for years ever since I worked in the health food industry and saw what a con it is, a good diet is all you need. I run about 3000 miles a year, last year I raced 858 miles with a total of 141 800 feet of ascent in 25 races, on average 34 miles per race. The nature of ultras means that there is always going to be an element of pain involved. I find that running in beautiful and spectacular scenery is perfect for taking my mind off the pain and reminds me how lucky I am to be doing this. A bit of suffering in a race or a run means you are pushing yourself to the limits so is a positive thing most of the time, also it's a good thing to remember the option to stop is always available unlike some people in this world who have real-life suffering and pain to deal with. When I ran Fuego y Agua in Nicaragua worrying about if there was going to be gels or food at the next aid station seemed crazy when you saw the poverty of the local people, two worlds colliding indeed. Last weeks 24 hour race in Keswick, a new challenge awaits! At one stage or another most of us end up sleeping in the airport to catch an early flight or after a delay. These huge buildings, present in most big cities and kept at a pleasant temperature, never close and can be used as a cheeky free place to kip. Its not going to be like staying in the Savoy but this series isn't called COMFY SLEEP. A little preparation will pay dividends. You'll need things like a sleeping bag, roll mat, food and drink (so you don't have to resort to airport prices), and maybe some bedtime reading. Don't bother trying to sleep in the chairs, unless you are adept at sleeping sitting upright. Find a bit of carpeted floor somewhere out of the way and hit the sack. Won't the cleaners nick my stuff? Just don't take too much stuff. Use your bag as a pillow so you'd be woken up if someone tries to nick it. Keep all your valuables inside the sleeping bag with you. If you've got loads of stuff you could try putting it under a seat near a wall and sleeping in front of it. If you are made of money you could use the baggage storage. . .
Is it legal? Will an airport official wake me up and tell me to push off? Is it dangerous? With a few hill races coming up soon, I thought I'd better get a bit of training in the hills. So, on Saturday I went out for an hour in the Pentlands and, on Sunday, I drove up to Kirkton Farm and ran up Ben Challum. A good amount of the ascent is runnable and the views from the summit, south to Ben More and east to Ben Lui, were excellent. Navigation was straightforward as you just follow a set of fence posts (and the procession of walkers). Passing walkers seems to affect the hill runner in a number of odd ways. Firstly, in a valiant attempt to prove that I'm not an idiot, I feel the need to grin like an idiot. Next, I show off by speeding up as I overtake. Its odd behaviour I think, boasting to strangers. Even though it was a rainless day, it was fairly windy and most of the walkers were wrapped up warm with hats, gloves and jackets. It must seem slightly unhinged that I was trotting past, perfectly contentedly, in shorts. One couple, sat drinking coffee, gave me some jelly babies and said, "Well done!" Use the Internet to find a couch to sleep on. One way to get a free nights lodging is to break in to someone's house. You are then likely to have several more free nights lodging under lock and key. Perhaps a better source of free accommodation is staying on a mates floor or sofa, or camping in their garden. Don't wait to be invited, tell them you are on a trip from A to B and ask politely if it would be ok to stay the night. Only pretty hard-hearted people will say no. Be sure to offer to return the favour and invite them to stay with you. As I discovered recently, gate crashing a stag do is a good option for a nights kip (or a nights partying). I guess the moral is to keep an open mind and be in the right place at the right time. If you were incredibly good looking you might be able to rely on being invited back to a bed somewhere where ever you go. . . If you don't have mates in convenient locations, and you are not as hot as Penelope Cruz, you could try becoming a member of one of the reciprocal hospitality networks on the Internet such as globalfreeloaders, couchsurfing or the hospitality club. There is also one specifically for cyclists called warmshowers. Isn't that dangerous? Well, crossing the road is dangerous. These sites tend to include a few security features such as giving references from previous hosts/guests or some kind of personal vouching scheme. There needs to be a bit of trust and you may feel safer if you don't go alone. Mostly you will meet and stay with nice people. However, exchange a few emails first and if you don't like the sound of them, don't stay with them. In actual fact having people come to stay with you can be good fun, and is rarely much of a nuisance. As a rule of thumb, each time you stay with someone you should invite someone to stay with you. Bringing a gift to say thank you is a nice touch too. A lightweight option and perfect for those who enjoy soggy misery. If you are considering using a bivvy bag as an alternative to a tent when hill walking, I would heartily recommend you read The Book of the Bivvy by Ronald Turnbull. In fact I would recommend you read any of his books, or articles, which are always both inspiring and witty. 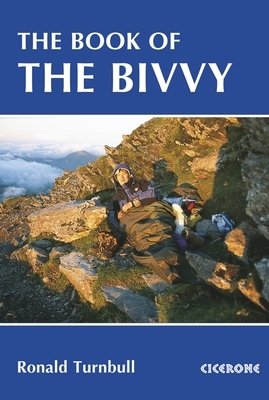 The Book of the Bivvy manages to combine a wealth of useful information, interesting mountaineering history, humourous anecdotes, and some suggested hiking routes, particularly in Scotland. It discribes how goretex was discovered and its optimum conditions of use. Turnbull is provocative in his outdoor philosophy and the sections on food, what to pack and how to choose a good site for your bivy, can be indiosyncratic. Nevertheless, he is practical and logical and can back up what he says with examples from his own experiences. A stove is a luxury. You'd get more heat into you by eating the fuel blocks. As water is abundant on British hills it need not be carried in the form of lunch. Sugar should not be the basic food: large chunks of chocolate lead to sudden energy surges followed by famished reaction. Healthy food with vitamins is heavy and doesn't travel well: I do a lot of healthy eating on shop doorsteps. Suitable food for carrying will be starchy carbohydrate in a fairly dry form at four calories per gram, with some sugar and fat to improve the ratios. Which means almost anything, really. There is a kind of non-intuitive logic to his musings. Take this advice on how many clothes to pack. Suppose all of your clothes were wet and all of them on. If that's enough to let you survive the storm, then that's the clothes you can't do without - three wet layers and a waterproof. No dry clothes for next day? Well, if it's raining next day then those dry clothes would very soon be wet ones. And if it isn't raining, then these wet clothes will very soon be dry. The very best chapter is called Time, Things and Miguel but you should really just buy the book and read it! 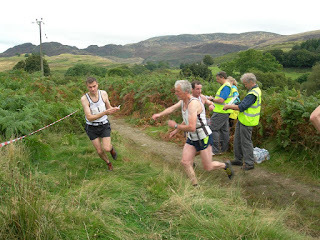 On Sunday I joined one of three CAAC teams competing in the Comrie Hill Relay Race. The first team came second, our team came third and the third team came 18th. All in all a fantastic day. I ran leg 2 with Tim and it was fairly tough going. The initial ascent was fairly gradual but then required a fair bit of heather bashing. Then we followed a fence up to the summit and pegged it down very steep heather to the road. After a mile on the road we handed over to Alex. The day was sunny and the bbq, beer and village cricket rounded off an excellent day. Also Martin was surprised with a card and a cake to celebrate his 60th. Here he is with Graeme beginning leg 2.